This morning when I pushed my bike outside the motel, I was pleasantly shocked with how cool it was. I was tempted to put on my wind breaker, when I recalled the stifling heat of the last several weeks. Ain't no way I was gonna block any of this cool wind. I relished in it for most of the day. Today's ride was uneventful. More rolling hills through scenic, rural Kentucky. The penultimate state. It is hard for me to get my head around it. 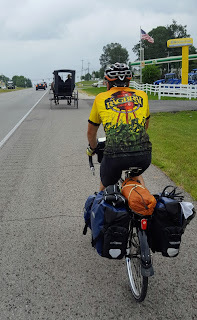 I"ve pedaled across 8 states. In some ways it went by so fast and in other ways it seems to be taking forever. I'm ready to get home! This trip has been amazing, but Im tired...physically, mentally and emotionally. However, I still have 2 states to finish and more things to experience and discover. So tomorrow it's put my big boy pants on and pedal! Today I crossed a couple milestones. First, I crossed the Mississippi River and with that, I'm now in the eastern part of this country. Second, upon crossing the river I entered Illinois, the 8th state of this trip. As you can see by the mileage and the milestones, this was a big day. The first half of the ride was hilly, while the second half was flat. I think the second half was the more difficult, owing to the heat and the fact that there wasn't an iota of shade!! The sun beat down on me relentlessly. For the last half, I chose an alternate route, which was called the Mississippi Levee Alternate. I'm envisioned riding along this levee with idealic views of the river...NOT...I didnt even see the stupid river. I found myself out in the middle of nowhere...among one lane, poorly marked roads...trying to find my way...did I mention the unrelenting sun that beat down upon my pitiful head??? The map showed a restaurant in the tiny town of Neunert, and low and behold, when I rode by, they were open! I staggered inside, starving, thirsty and spent. The two ladies working inside treated me like royalty. I drank glass after glass after glass of ice cold water!! I ordered the Reuben sandwich with potato salad and in short order devoured every morsel if this delectable treat. They even filled my water bottles to the brim with ice and water. All of this for the sum of 7 bucks and some change!!! I left there a new man...thank you ladies...or were they angels? The city of Farmington converted the 2nd floor of the old county jail to a hostel for Transam Cyclist. What a jewel. Today was an easier day than yesterday. There were less hills and they weren't as steep. I didn't have to push my bike...WooHoo! Once again, I'm staying in a city park and within a stone's throw is the community pool. I spent the afternoon lounging and swimming and eating freezer pops. Ain't nothing wrong with that. The last couple days I've been riding and camping in the company of the couple from England (David and Jess) and Seth from CA. I've really enjoyed their company. In the evenings we sat around the picnic table and enjoyed a couple cold beers and talked. I suspect tomorrow we will be going separate ways. They are riding a short day tomorrow and taking a rest day the following day to enjoy a river float. I will be pushing on! I am saddened to part company. I started riding at 5:30 AM. 7 miles later, I bid farewell to Kansas and hello to Missouri, my 7th state on this tour. Missouri didn't say hello in return until later in the day. I'll get to that in a bit. 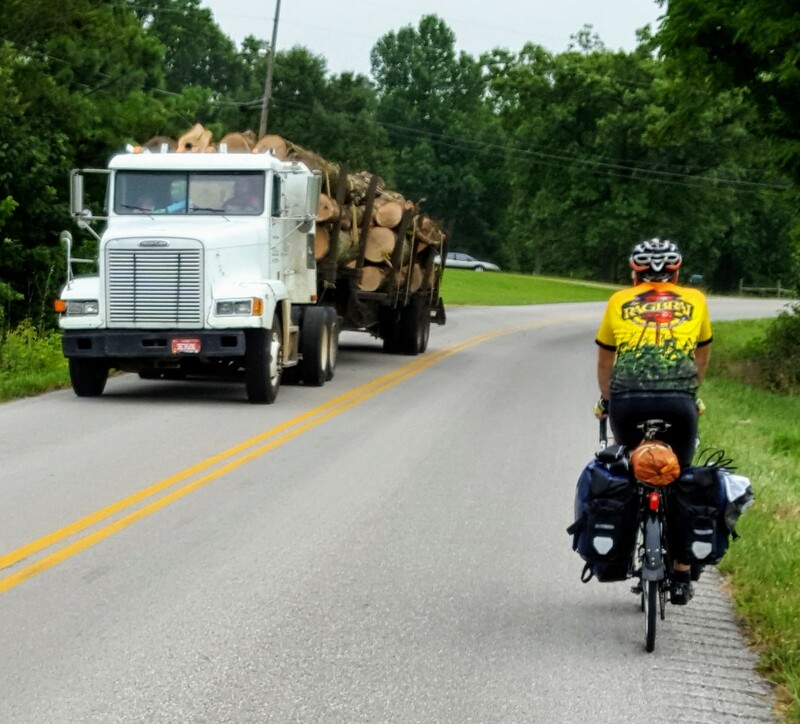 As I was taking the above photo, Seth, an east bound rider from CA, came up behind me. They had both just come out of the oven...they were warm, fresh and melted in my mouth! After Golden City was when MO welcomed me fondly with countless roller coaster hills that will be my joy ride for the next 4 or 5 days. I use the term "joy" loosely here. They might truly be a "joy" if the uphills had those clicky chain things that would pull me to the top...but they don't. In Ash Grove, Mary, my sister-in-law (Lori's sister), picked me up and I'm going to spend a couple nights with her and her husband Eric. They live just outside of Springfield.